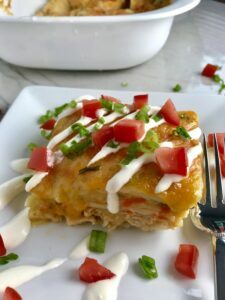 White Enchilada Casserole with Chicken & Veggies is creamy, hearty, cheesy, delicious, and easy because everything is layered in one dish and baked. 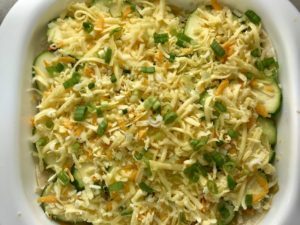 It has everything you love in a White Enchilada Casserole with the bonus of hidden vegetables with extra vitamins and nutrients! 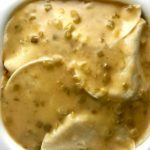 PLUS…The sauce is a lighter version because I have substituted the sour cream for a gluten free thickener and coconut milk. I promise you though, you will not miss a thing as the flavor is as decadent and cheesy as ever! 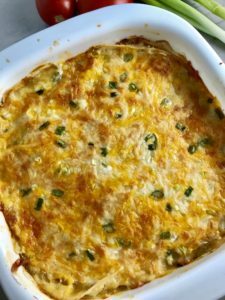 I have been making traditional red sauce chicken enchilada casseroles in different variations for years, but wanted to try something new with a white sauce and I was also looking for a way to sneak in more vegetables for my kids and husband. Even picky eaters will love eating their veggies because they won’t even know they’re in there! This White Enchilada Casserole recipe is a great way to SNEAK in MORE VEGGIES! 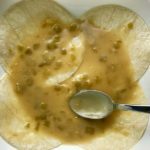 It’s one of those dishes that tastes so decadent and ‘bad for you’, that you would never think there are healthy veggies inside. So what’s in here? Are you ready for it? 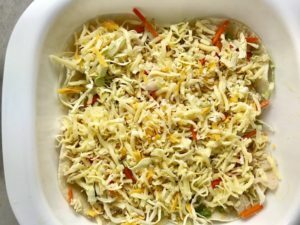 COLESLAW MIX and ZUCCHINI! 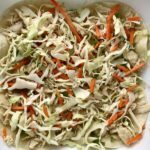 The Coleslaw mix is so great, because the cabbage and carrots are already shredded to the perfect size. 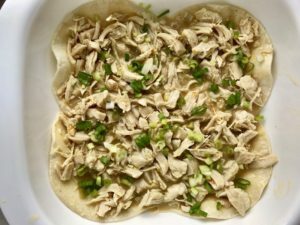 When they are cooked they are a similar texture and size as the shredded chicken so they blend right in and take on the flavors of the casserole. 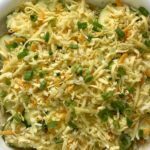 Zucchini similarly gets layered into the casserole and blends right in. I am not kidding, my family could not even tell! 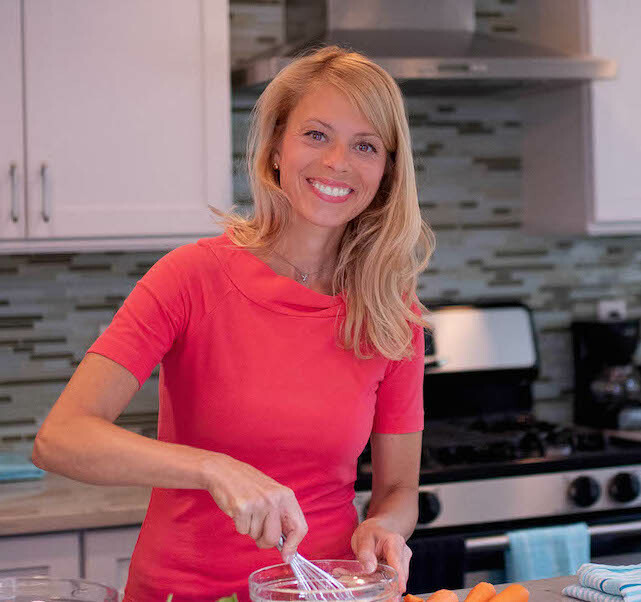 You are busy, so these are the steps you can do a day or two in advance to prepare food ahead! 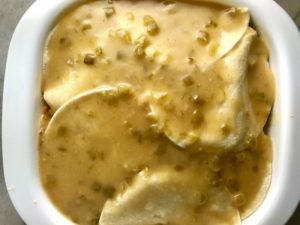 Actually, this ENTIRE casserole can be made in advance, then frozen or stored in the refrigerator. Roast and shred the chicken breast. TIP: You can buy a cooked rotisserie chicken from your supermarket and simply shred away! This will save you a cooking step and you will have chicken legs and thighs to enjoy later! Make the sauce. 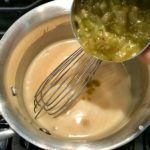 The sauce has green chilis and taco seasoning to give it that Mexican Enchilada White sauce flavor. 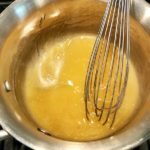 However, my version of the sauce replaces the heavy sour cream with coconut milk and a corn starch thickener which still gives you the thick, rich, and creamy texture you want. You can also slice the scallions and the zucchini ahead of time. Now, you can stop here and assemble later or just go ahead and assemble ahead of time, as well as cook. The assembly is easy-peasy as you simply layer everything on. No getting frustrated trying to roll the enchiladas first and watching them break or crack and then fall apart as you try to transfer them to the casserole! Simply layer away. Once everything is assembled, bake the White Enchilada Casserole covered for 45 minutes in a 400 degree oven. 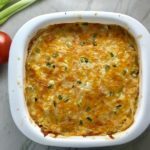 After 45 minutes or until the center is fully heated through, take the casserole out and add the final layer of cheese and scallions to the top and bake uncovered for another 10-15 minutes until the cheese is melted and golden. 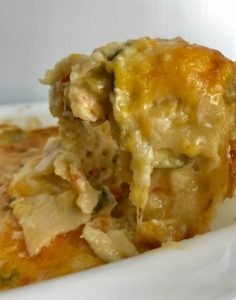 White Enchilada Casserole with Chicken & Veggies is hearty, cheesy, delicious, & easy because everything is layered in one dish. 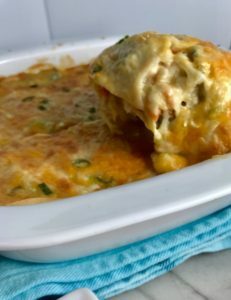 It has everything you love in a White Enchilada Casserole with the bonus of hidden vegetables with extra vitamins and nutrients! 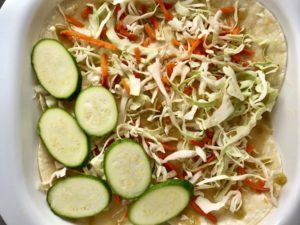 Even picky eaters will love the veggies because they won't even know they're there! 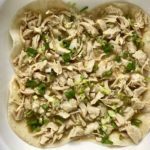 Rub the chicken breast with olive oil, sprinkle with salt and pepper and roast in the oven for 20 minutes or until internal temp reaches 165 degrees F. Take the chicken out and let cool for 10-15 minutes until cool enough to shred. Shred into small bite-size pieces. TIP: buy a cooked rotisserie chicken so all you have to do is shred it! While the chicken is roasting, make the sauce by starting with the corn starch slurry. 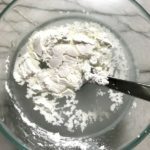 Mix 2 tbls corn starch into 1/4 cup cold water until completely dissolved. To a small sauce pot, add the chicken broth, corn starch slurry, taco seasoning. Bring to a simmer stirring until it gets thick. 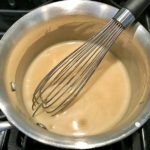 Whisk in the coconut milk then turn off the heat. Add the Green Chilis and mix in completely. Finely Dice the Scallions. Slice the zucchini on the bias into 1/4 inch slices. At this point you can either move on to the assembly or put the scallions, zucchini, sauce and the chicken in the fridge until you are ready to assemble. 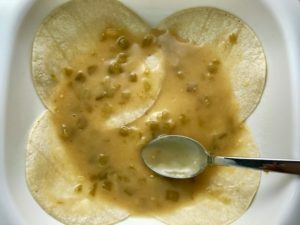 Spread a very thin layer of sauce on the bottom of the casserole dish, so that the tortillas don't stick. 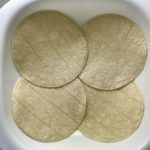 Next, lay down 4 tortillas, or as many as you need to cover the bottom and making sure you have enough for 3 layers. 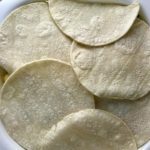 Spread a layer of the sauce over the tortillas. Spread half of the shredded chicken over the sauce. Then sprinkle scallions over the chicken. 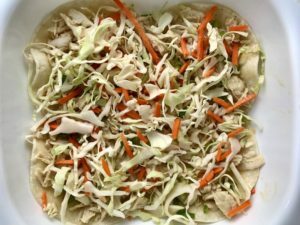 Sprinkle the coleslaw mix of cabbage and carrots over the chicken. 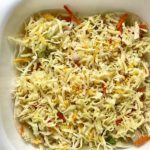 Add shredded cheese. NOTE, you should have 16oz of cheese, which you will need for 3 layers in total, so be sure to portion it out so that you only use 1/3 of the cheese in this first layer. Next layer another 4 tortillas over the cheese, then sauce, add the rest of the chicken, and another layer of the coleslaw cabbage and carrots. Now comes the zucchini. Lay the slices to create a single layer. Use any extra to fill in any major holes. Add another layer of cheese (using another 1/3 of the cheese) and scallions over the zucchini. Add the final layer of tortillas making sure to fill in any holes with broken tortillas. Spread the final layer of sauce over top. Preheat oven to 375 degrees F. Then bake the casserole covered with a glass lid or aluminum foil for 45 minutes. 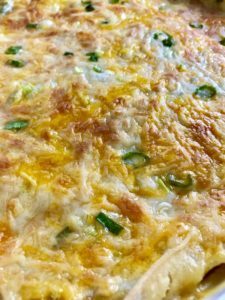 Remove from the oven and add the final layer of cheese and scallions to the top and then bake WITHOUT a cover for another 15 minutes until the top is perfectly melted and golden. Serve and Enjoy! I did use just 8 oz of cheese and it Really was plenty. Also, next time I might julienne the zucchini. I used organic ground chicken for convenience. 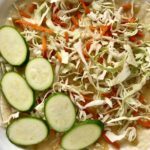 LOVE having the coleslaw and squash “hidden” inside!! Thank you for the healthier version for the sauce!! !